For more extensive lists of our publications, including non-refereed works, opinion pieces and invited lectures, please see our "ACSER in the media" page, or the relevant Annual Report. Australia’s Satellite Utilisation Policy was released on the 9th of April 2013. As of April 2015, there has been no “official” response to this policy. Despite promises from the Space Industry Association of Australia that there would be such an official industry response, two years later, it has not emerged. Given that the policy was not greeted warmly across the industry, we felt that some sort of response must be published. 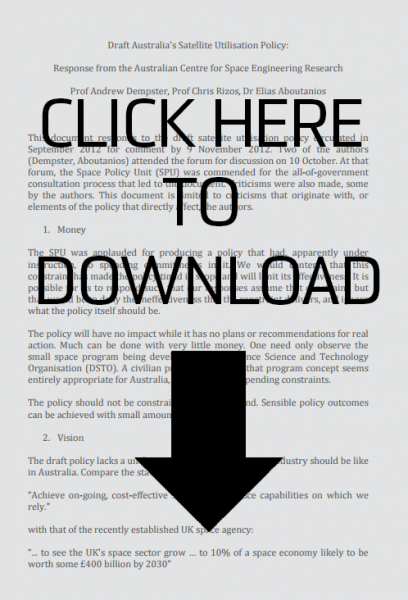 Subsequent to the policy’s release, we have published (here and here) proposals for how and why Australia should be more ambitious than the policy would suggest, but we had not responded directly to the policy itself. In the absence of an industry response, we decided to publish our response to the draft document, which indicated the flaws we noted in the policy.